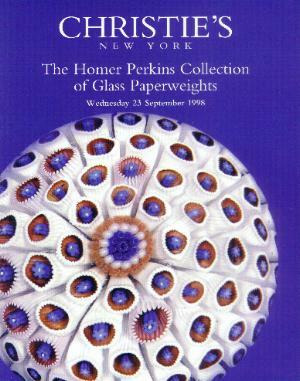 (New York, September 23, 1998)"
Wonderful catalog from Christie's sale of the Homer Perkins Collection. This is an important sale of a rich and varied collection. 21 lots are contemporary, the rest are antiques. When Homer announced he was putting his collection up for auction he shocked the collecting world. Those who know him thought he would never part with his wonderful collection, especially the St. Louis weights that he loves so much. Mr. Perkins still has the bulk of his contemporary weights to enjoy. The collection was started in 1960. Homer Perkins sold his collection once before, in 1981, but started collecting over again in retirement. There are 182 lots in this auction. Every lot is shown in color plus there are two full page color plates. The antiques include French and American antiques. The 21 contemporary weights include spectacular examples of the work of Delmo and Debbie Tarsitano, Paul Stankard, Ray and Bob Banford, Paul Ysart, Charles Kaziun, and St. Louis. 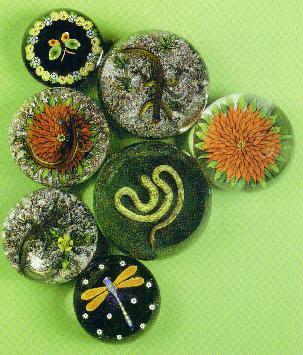 The catalog is another of those "must have" catalogs which deliver high quality color pictures of every lot. was $25,300 for a rare Baccarat Faceted Ducks in the Pond paperweight. 8 1/4" by 10 1/2". 96 pages. Soft bound. Click on the picture to see an example of one of the full page plates.